Holyrood Secondary School is now using mySchoolApp and this guide to help get you set up. mySchoolApp is FREE for you to download and is part of the school’s commitment to communicate with you, in a way that fits in with your life. 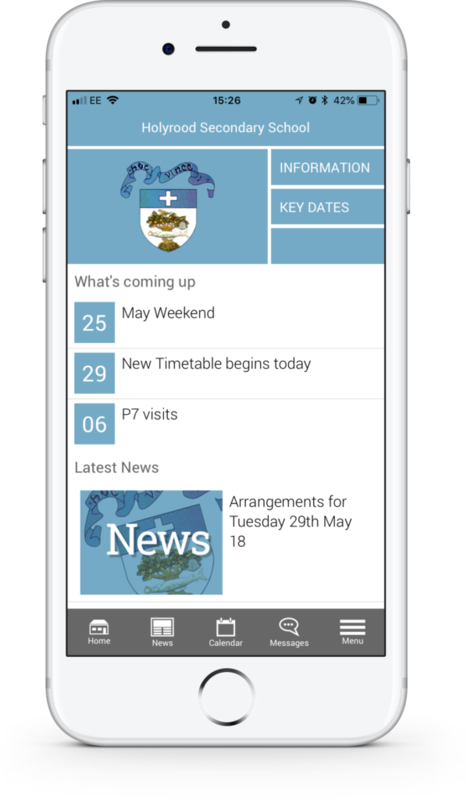 Keep on top of what’s happening at school with mySchoolApp – it’s all just a couple of taps away. We hope you find the app useful. If you do, please recommend it to other parents at the school – the more that download and use the app, the easier and cheaper it will be for your school to keep everyone up to speed. Instant access to an up-to-date school calendar. Any events that are relevant to you, can be added to you own calendar with one tap on the screen. Keep up to date with what is happening at the school. Read bite-sized news items and scroll through the school image gallery. Direct contact links to the school – one touch dialling / email. Push notifications sent by the school, let you know the important stuff as well as helpful reminders (eg. snow days, school trip late back due to traffic, mufti days etc). Translate app content into 60+ languages (available only if the school has enabled this feature). The first step is to get mySchoolApp on your phone. The easiest way, is to use your phone to search on the App Store (Apple) or Google Play (Android) for mySchoolApp. It’s the one with the multicoloured stickboy app tile. Alternatively, you can click one of the buttons below which will take you to the correct page on the app stores. On the opening screen enter Holyrood. Once you have entered a few letters, the app will give you some suggestions. Tap on our name and you’re logged in. You only have to do this once, mySchoolApp will remember your school automatically in future. Push notifications enable the school to notify you of new messages or events without the need for you to actually open the app. It is recommended that you choose to accept push notifications from mySchoolApp, to ensure that you receive important communications, such as a school closure due to snow or a late coach return, etc. If your school has created notification groups you will see these in settings. Simply opt in, to receive notifications from the groups which are of interest to you. This function enables the school to send messages to specific year groups or sports teams for example. If you experience any problems with the app set up, please contact the school, visit the mySchoolApp support site or email support@myschoolapp.co.uk. If you get in touch, it will help to let us know that you’re logged into Holyrood together with the make and model of your phone.